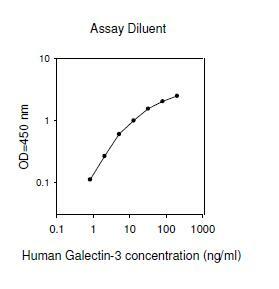 RayBio® Human Galectin-3 ELISA Kit for cell culture supernatants, plasma, and serum samples. Birala BK., Perumal V., Gohil NK. Glycated serum albumin stimulates expression of endothelial cell specific molecule-1 in human umbilical vein endothelial cells: Implication in diabetes mediated endothelial dysfunction. Diab Vasc Dis Res. 2015 Jul;12(4):290-7. doi: 10.1177/1479164115583192.